Sync the pedal to moto-metal while twisting, turning and riding for your life in the cyber-fi world of TRON! Experience high-speed thrills and chills as the Grid comes alive in a heart-pounding race for survival. Created as a friendly way for “Programs” and “Users” to interact, the Power Run pits team against team in the quintessential quest to capture 8 Energy Gates and triumph over opponents. Prepare for digitization after entering the portal—this is your access into the energy, lights and excitement of TRON’s high-tech universe. As you leave the real world behind, you’ll proceed to the games as a member of Team Blue, ready to compete against some of the Grid’s most menacing Programs. Adrenaline-pumping music, lights and 3-D graphics inspire a furious surge toward the winner’s circle. Traverse TRON’s electrifying multi-sensory environment as you speed, dip and dive through digitized darkness on one of the fastest indoor roller coasters in Disney theme park history. 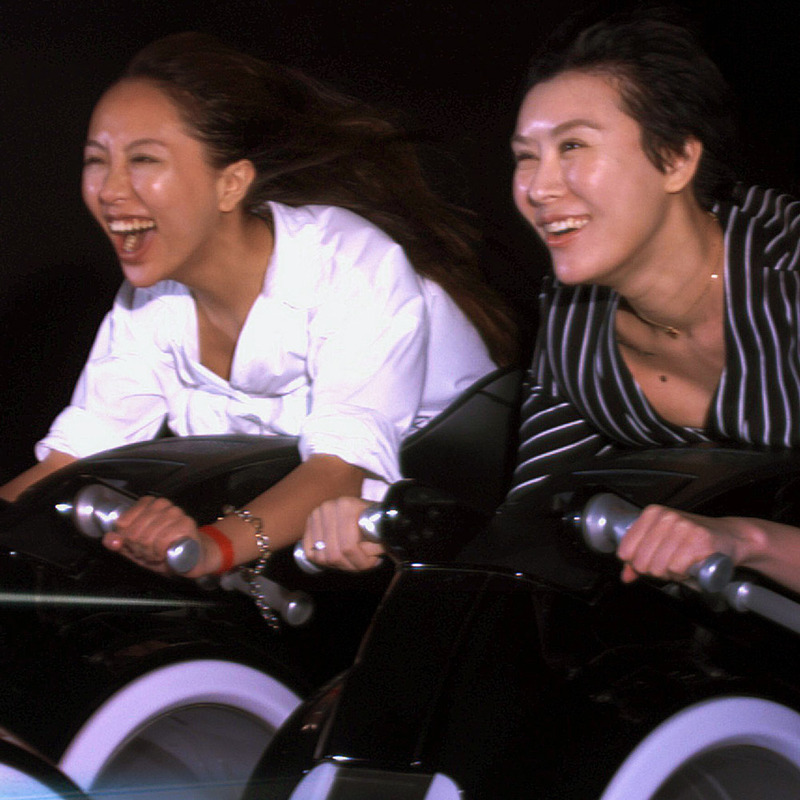 Step inside the techno-style zone featuring glowing glass rails, a real-time Raceview and blue laser lights that etch patterns through space—this is where Users synchronize with their Lightcycles. Feel the power activating as you jump on, grab the handles and brace to face an unknown digital frontier. Anticipation heightens as the Lightcycles lunge forward with sound effects building to a feverish pitch. Suddenly, you’re throttling through a tunnel of flashing markers and, just as quickly, plummeting onto a turbo-charged track known as the Grid! Filled with brilliantly illuminated shapes and sleek, color-changing TRON iconography, this game-world “gravity box” seems to rev harder with enhanced energy as Lightcycles catapult past each Gate. Will Team Blue capture them all and take the championship? See if you can defeat the Programs, survive the Power Run and make your way back to the real world! Groundbreaking computer animation and brilliant visual effects created a legacy that delights fans to this day. In 1982, Disney made filmmaking history with TRON, the first production of its kind to mix live-action with computer-generated visuals and backlit animation. Loved by legions around the world, it went on to inspire video games, comic books, an animated series and the 2010 big-screen sequel, TRON: Legacy. 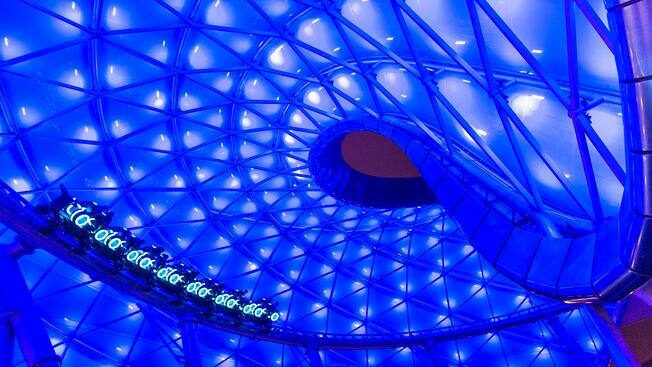 Today, Shanghai Disneyland honors the franchise with one of the coolest and fastest indoor roller coasters in any Disney theme park—TRON Lightcycle Power Run. 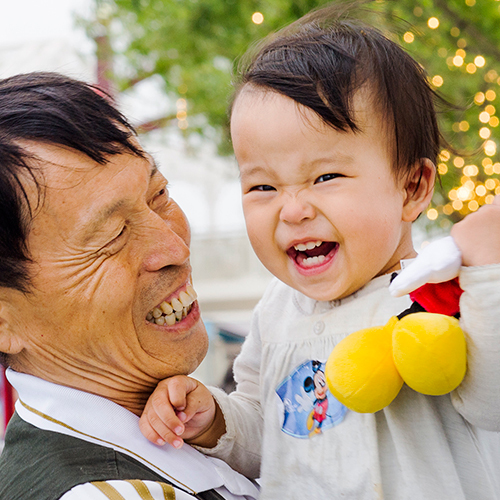 Save your place in line while you enjoy the rest of the park by picking up a Disney Fastpass ticket from Shanghai Disney Resort Official App! Check Wait Times in the Theme Park with Our Official Mobile App! 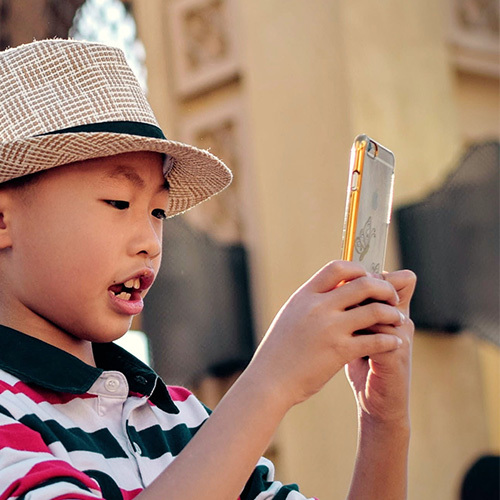 Download the Shanghai Disney Resort mobile app before your visit for attraction wait times, height recommendations, map locations and much more.